If you happen to own an Apple device and need a pair of headphones to go with it, Bose might have the right accessories for you. The SoundTrue Ultra in-ear headphones promise to offer deep, rich sound across a wide frequency range. Since they're not wireless, they come with an inline microphone and remote right on the cable, which should allow users to switch between calls and music with select iPhone models. Also, you'll be getting a protective carrying case in the box. 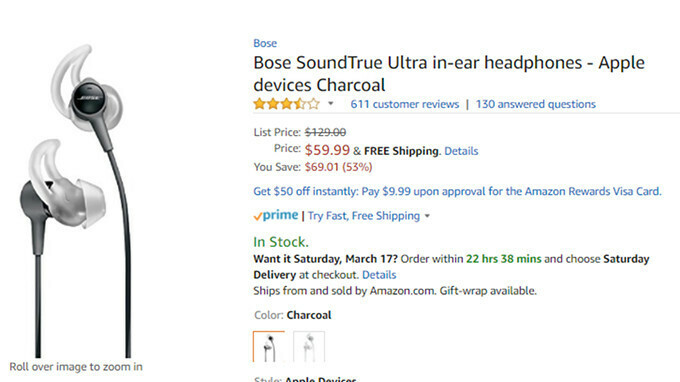 Usually, the Bose SoundTrue Ultra in-ear headphones sell for $129, but Amazon has them on sale for 53% off, which means you'll be able to get them for just $60. Keep in mind that these headphones will only work with Apple devices, if you're using an Android phone, you'll need Bose's SoundTrue Ultra in-ear headphones specifically designed for these devices. Luckily, they're on sale as well for $90, so you'll be saving $40 if you buy them now. If they can sell these for $60 with Apple's ridiculous licensing charges, I expect to pay $30 for an Android set, not $90. PASS. These will work with Android phones too, you just lose the use of the volume buttons.